These vacuum pumps are used when the intake flow may contain moisture, or when a better final pressure is required. These pumps may run continuously within certain pressure ranges, or connected to containers to be emptied, whose volume is appropriately sized for the pump flow rate. Long-term use at atmospheric pressure is not recommended. The lubrification allows this pumps to intake water vapour. To avoid a condensation of the water vapour, the pumps are equipped with a system called ""Gas Ballast"", that introduces air in the compression stage and changes the vapour saturation pressure thus avoiding the condensation. D.V.P. developed a WR pump version with an improved and reinforced Gas Ballast system. 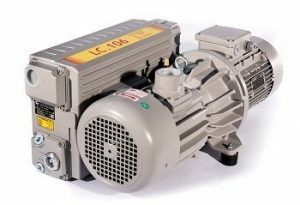 The main application fields of these pumps include: vacuum sealed packaging, thermoforming machines, glass or marble working machines, medical equipments, food-grade pastes or clay extruders.